The Sales and Marketing Suite is situated within Dower House, a locally listed property which was converted into two dwellings for sale. The Design process has therefore been very intricate and our goal was to design and deliver, a state of the art Sales Suite that is sympathetic to the listed property and works with its historic features. Atellior has been appointed to design the Sales & Marketing Suite at Trent Park; a luxury residential development comprising restored and new build homes and apartments. Set within the wider 320 hectare Trent Country Park, apartments, town and mansion houses within the development enjoy stunning landscapes and greenery. Rich history of Trent Park has provided ample inspiration for our interior design. It’s famous residents included Sir Phillip and Sir Edward Sassoon, Sir Winston Churchill, Queen Mother and young Queen Elisabeth II herself. Black and white photography and paintings of these most famous residents decorate the walls and form an eclectic mix with additional contemporary art adorning the walls of the suite. Site surrounding lush greenery has provided inspiration for the FF&E scheme. Rich hues of green velvets and deep blues are used to upholster contemporary pieces of furniture. 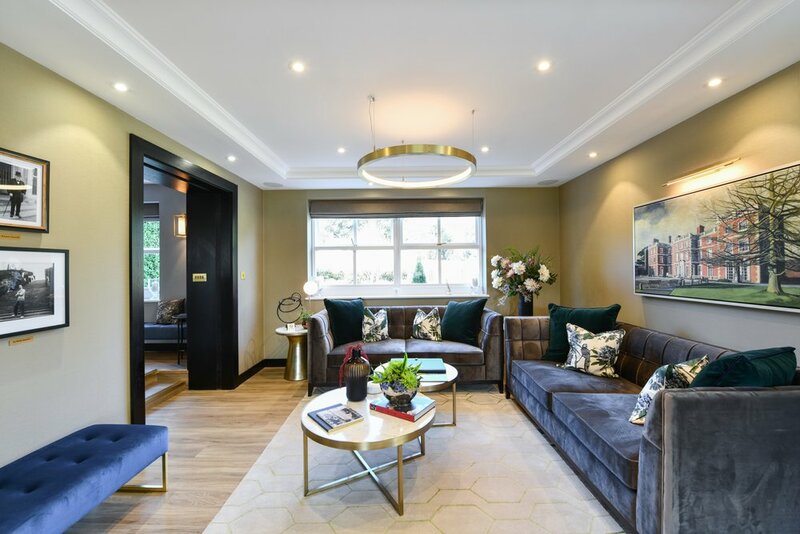 Brass accents and dark timber veneer create opulence and classic elegance that appeal to the purchasers of this North London development. Rich history of Trent Park has provided ample inspiration for our interior design. Brass accents and dark timber veneer create opulence and classic elegance that appeal to the purchasers of this North London development. Site surrounding lush greenery has provided inspiration for the FF&E scheme. Rich hues of green velvets and deep blues are used to upholster contemporary pieces of furniture.